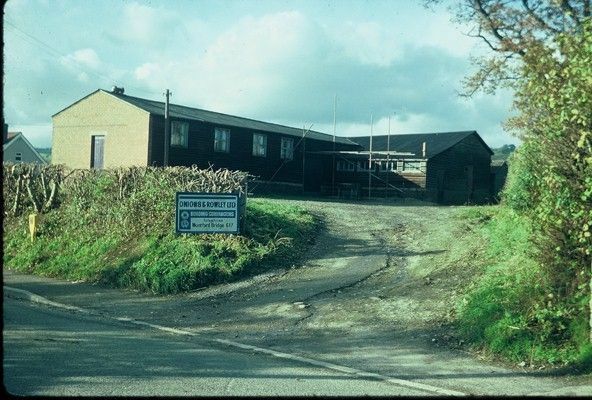 The photo was taken by Percy Blakemore just before the demolition of the hall, known locally as 'the hut'. It was originally constructed in 1922, out of spare huts from an army camp near Oswestry, and was built under the auspices of Worthen British Legion, as an ex-servicemen's memorial hall. The brick gable end, visible on the photo, was a later modification; originally, apart from the foundations, the hall was entirely boarded. The initial elected trustees of the hall were Major Montgomery, D Hoggins, E Benbow, R Vaughan, F Brown, W Speake and F Blakemore. Some stoves came with the purchase of the hall. Spirit lamps were used for lighting until 1936, when electricity came to Worthen. A kitchen was later created within it by the Women's Institute. After the hall was taken down a new village hall and doctor's surgery were built on this same site, between Brockton and Worthen. David Hoggins, schoolteacher, played a prominent role in village affairs before and after the 1st WW, as did his wife who founded the WI in Worthen and was leader of the Girls Friendly Society. Mr Hoggins went on to teach at Berriew Road Boys School, Welshpool. The field behind the hut was given to the community as an amenity in 1927, Known as the Powell-Dicken field, it was probably funded by members of these families (? ), the Powells being influential in Worthen affairs over several centuries. A 'Powell-Dicken Playing Field Association' was set up to oversee its use; prior to the 2nd WW the Rev Daniel McKay was secretary of this, he being the minister of both Brockton and Bromlow Baptist chapels.